We got a chance to "sit down" with artist Dave Flora, who is featured on Artistic Vision's Artwork section. Artistic Visionz: State your name for the record, please, and your approximate age, if you please. Dave Flora: Ahem. 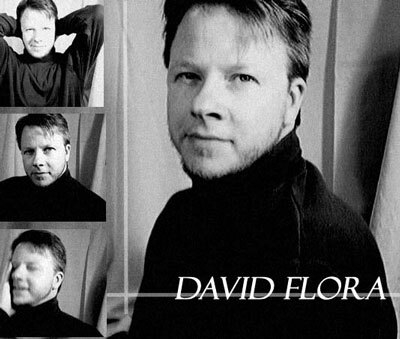 Most people call me David Flora. Others call me Deedle-bug, but anyone outside of family that calls me that is looking for a poke in the jaw. I was born approximately on April 28th, 1968. That makes me 34 this month. AV: Where did you grow up, where are you from? DF: I was born on a dairy farm in rural Kentucky. It was pretty much slave labor, but looking back, it was a great way to grow up. AV: Where do you live now? DF: I live about 30 miles from where I grew up. I'm a big fan of "place", and have discovered that I like small towns. Very friendly. AV: How early on did you begin to draw, more than just kid-squiggles? When did you "take a shine to it"? DF: Well, my brother introduced me to comics when I was around 5...I actually learned to read from comics. Later on, I started tracing pictures that I liked (Ironman was the first) until I realized that I didn't need to trace the pictures to make it look right. As you can tell, comics have a big impact on my art, although I also do classical oil portraits. AV: Was there any one person who encouraged you or inspired you to do your art? DF: Hmmmm. 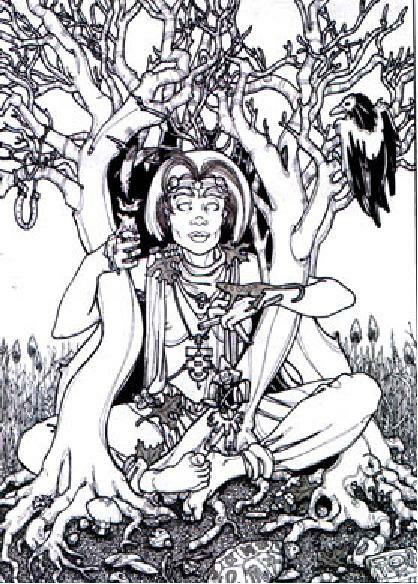 Early influences came from John Byrne, Jeff Dee, and Larry Elmore. My interest in role-playing Games gave my art a new avenue to travel down. Nowadays, I think that Mike Mignola and Adam Hughes are big favorites. AV: Where did you attend college, and did you study professionally to be an artist? DF: I attended Morehead State University here in Kentucky. Yep, laugh at the name, it's unique. It does have a great art department, though. I received my first bachelors degree in Art. That was in 1990. AV: Does your current job reflect and/or include your artistic talents? DF: Currently, I'm completing my second bachelors degree...this one in Electricity/Electronics. It's nice to have a steady paying job to support all those nasty habits...like art! AV: What is your dream job? DF: I would like to work as a conceptual artist. I love it when people come to me and ask, "I've got an idea for this thing. It looks like... Can you do a picture of that?" I'm an illustrator at heart. AV: What is your favorite thing to draw? DF: People. They can be superheroes, fantasy babes, or old men. As long as they are expressive, I love getting it on paper. In fact, I often "force" myself to do backgrounds or items just to make sure that I can do them. AV: What is the easiest thing to draw? DF: Faces. I've never had much trouble with getting down the kind of expression that I want, or the correct features. Hands and feet aren't too bad either. Backs give me the most trouble, because there's lots of musculature there that I have to be careful to render correctly. AV: What is your favorite medium? AV: What influences your creativity the most? DF: New ideas. When I come up with a different idea for a character or place, I get excited. Sometimes the ideas come from movies, books, or other people; but when it hits, I can't rest until it is on paper. I've found that RPGs keep my creative juices flowing, too. AV: Music is often a big influence. Do you have a favorite type of music or a favorite group to listen to while you draw? AV: What other artists do you admire or have influenced you? DF: I enjoy the graphic pattern in Mucha's work, and Albrecht Durer. As far as color goes, I really love the Pulp artists of the 30's. Those stories are darn good too! AV: Are there any other sources that inspire you, give you ideas, etc? DF: One of the ways that I get some of the most peculiar ideas spring from time alone, out in the country. There's a corner of my Dad's farm that I can go to that's kind of like a sanctum. Nature is wonderful about providing ideas. My piece "The Watcher in the Trees" is a piece directly inspired from time outside. It was a very symbolic piece for me. AV: Do you have any particular genres that enjoy more than others? DF: Dang thats tough. I really enjoy horror (stemming from my love of old black and white movies), along with Supers. Fantasy offers some great flexibility...I'd say the only thing I don't do lots of is Sci-Fi. I really enjoy it, but it isn't something that just comes to me. AV: If heaven exists, what would you like to hear God say when you arrive at the pearly gates? DF: How about "Geez. You took your freakin time, didn't you?" AV: Well, Dave, that's it! Thanks for your time! Be sure to check out the Artwork Spotlight on Dave Flora's work.